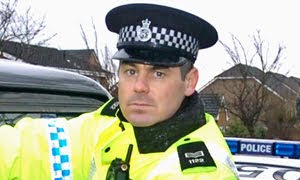 Sgt Charlie Tennant of Merseyside Police's Matrix Disruption Unit has been sacked for gross misconduct in Public Office. Tennant 43, is suspected of stealing items from homes that the Matrix raided and then selling the items on Ebay, he is currently on bail. Three other Officers are currently suspended and on bail. Nine Merseyside Matrix Police officers under investigation for theft and drug offences. 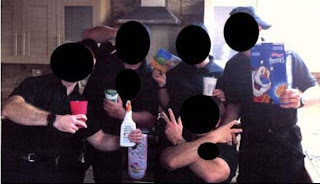 The three previously suspended Officers are in this photo. A further six Merseyside Police Officers from the forces Anti-Crime Matrix Unit have been suspended after images found on an Officer's mobile phone were of them clowning around during a house search relating to a serious crime. Images found on the mobile phone of an Officer previously suspended for theft and misconduct gave Police Chiefs reason to suspend further Officers. Another Officer was suspended for dealing in steroids.